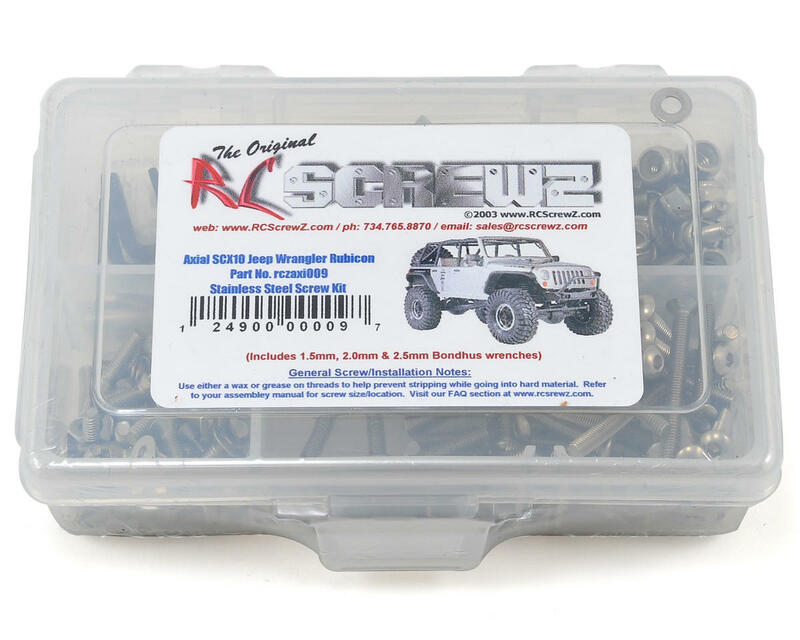 This is an optional RCScrewz Axial SCX10 Jeep Wrangler Rubicon Stainless Steel Screw Kit. RCScrewz stainless screw kits are 100% complete. This kit was developed specifically for the SCX10 Jeep Wrangler Rubicon and may not include the screws needed for other SCX10 kits. Your kit will include everything needed to do a full conversion and more. Stainless steel screw kits are far superior to the screws that come stock with your RC. RCScrewz kits are made with the best stainless steel money can buy. No more bent, rusted, or corroded screws. Never worry about stripped heads again. You will not find a better screw kit for your RC at any price and RCScrewz Guarantee's it. If for any reason your not 100% satisfied with your kit, return your screw kit to RCScrewz and they will send you a full refund for the price of the kit.